Moving on from the excellent The Barghest O'Whitby EP of last year, Yorkshire's most miserable band are as melancholic as ever. 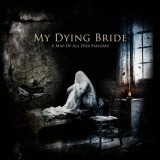 My Dying Bride's eleventh full-length sees the band equally as traditional in terms of writing, although it's a little lighter and features fewer growls. A Map Of All Our Failures is far from the instantly catchy gloom of the likes of Bring Me Victory - this seems more like a return to the days of Songs Of Darkness, Words Of Light, where songs are as much tragic tales as gothic dancefloor hip-shakers. Aaron Stainthorpe takes the role of storyteller, solemnly singing, declaiming, and breathily whispering his dread words as the band crank out a solid backing set of riffs. If that sounds like damning with faint praise, it's not intentional - although it takes multiple listens to get to grips with, A Map Of All Our Failures is a very good album. No rays of light are allowed to shine through in the hour-plus running time, no sudden shifts in style. From the opening funereal church bell's peals, it's clear that this is doom as cathartic trudge, an especially cultured and classy one, but buried in misery nonetheless. It's a particularly dignified misery, that grows on you unceasingly, that washes over you and leaves you more affected each time you listen, each time a melody begins to make sense and stick in your head. And believe me, they will - the melodies of the title track, for example, are slow and buried beneath the literal heaviness of the riffs and the emotional impact of the vocals, but they pack a mighty punch once you notice them. Emotions may be restrained, but from time to time they break loose, and the speedy, death grunts of a short yet shocking section of Kneel Til Doomsday are the result, galloping rage and madness that contrasts gloriously with the surrounding austere doom. For the most part, however, you have the likes of The Poorest Waltz, the clean vocals grasping your attention and leading you to damnation. Five out of eight songs here are over eight minutes in length, and two others are only just under that - yet My Dying Bride make good use of all that time, allowing songs to stretch and breathe as they work their melancholic magic. Surprise moments like the growled bellows in Hail Odysseus are seamless parts of songs, never feeling out of place or distracting you from the dark atmosphere. Graceful aural tapestries like Within The Presence Of Absence are not so much created as lovingly woven, violin and guitars working together to form an overall picture, in perfect unison as much as the church organs that feature here and there. Each song is its own tapestry, the album a superb collection, and it's hard to say much more about A Map Of All Our Failures. The title is fitting, as like a (very miserable) map it draws an overall picture, the detail becoming clearer the more you study it. Failure in name but certainly not deed, then; although My Dying Bride have not quite created a masterpiece here, it is a another compelling episode in the career of one of the genre's most talented. It'll certainly remain on my playlist for a long time, and few fans will not be enthralled.